I like the scale of this building. It is more geared to humans. The later JC Penny's, and maost other anchor stors are the 60 mile an hour type. They are made to be seen from the highway as you drive by. I have never seen this Penney's logo. I had never seen one like that either, didi, till now! Cool. I think I saw this type of Penney's logo when I occasionally went to Sault Ste. Marie, Michigan and browsed through their small store downtown before it was relocated near I-75. JCPenney had this logo in their stores in Alhambra, Monterey Park and Montebello up until all they closed in 1985 with the opening of the Montebello Town Center store. 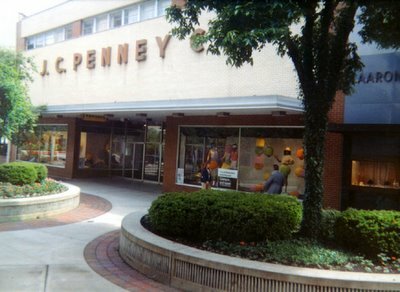 There's a labelscar from the same logo on the old Penney's in downtown Silver Spring, MD. I lived in Kalamazoo Michigan at one time. I though I remembered an old pedestrian mall there too. Does anyone know about that? It looked very much like the Battle Creek one which is not far away from Kalamazoo. Louise, Kalamazoo's downtown pedestrian mall - the Burdick Street Mall, I believe - was one of the first in the US. It would have been built sometime in the '50's, I believe. My hometown of Atchison, KS, modeled it's three-block pedestrian downtown mall after Kalamazoo's, but added some very early-Lenox-square style heavy concrete canopies over the storefronts down either side. The mall was installed as part of an urban renewal project after a flood devastated our downtown and took out quite a few buildings in 1958. We, too, had a JCPenney store that was virtually identical to this one in Battle Creek, though ours was not two story - it had a basement level and a main level. Our store also had this exact logo treatment, but in black. The store opened in 1962, so it must just have missed the more modern version with the big stylized "P."
This store has growth so much in the last couple of years, but the owners need to include more innovative and exotic articles, becuase everything there is so basic.